Colour block dress, from Aaylixir; cuff from Atelier Mon, at Minerali. Both in Mumbai. Silver bracelet, Hetal’s own. Clad in a top and jeans, the slim Hetal Dedhia strides into her studio with a natural confidence, completely at home amid all the lights, wires, grips, cartons of nuts and bolts and the miscellaneous equipment of her trade. 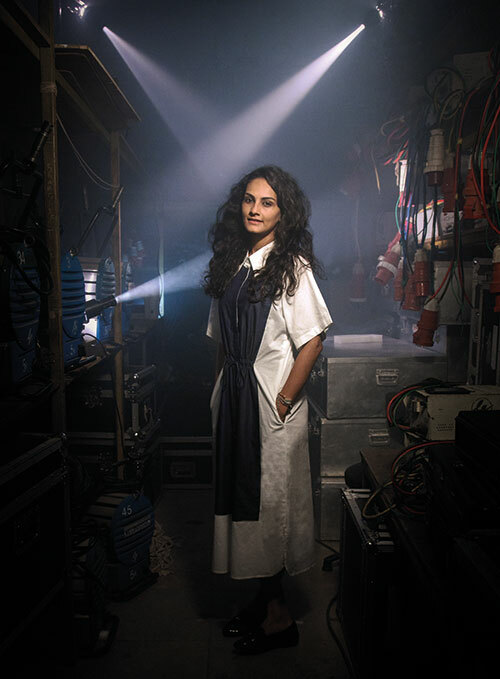 Born to the business — her father Mulchand Dedhia is perhaps Bollywood’s best-known gaffer (head of lighting and electrical) — she has earned the honour of being the first female gaffer in the Hindi film industry. Her appearance in the family-owned workshop triggers an instant alertness in the staff, who exchange greetings with their boss, before continuing with their tasks. Later, while interacting with them, her voice is soft but authoritative — she commands respect, after years of experience. The 31-year-old Dedhia — who has worked on projects like Luck By Chance and Karthik Calling Karthik and international productions like Eat Pray Love, Mission: Impossible — Ghost Protocol and Un Plus Une — can still recall her first impression on the sets. Although young at that time, she states, “I was around 11 and the film was Shekhar Kapur’s Bandit Queen. Even at that age I knew that I wanted to follow in my father’s footsteps and become a gaffer. I was lucky that he helped me fulfil my dreams.” Interestingly, her two elder sisters, Minal and Jinal, run the office of their family business, Light & Grips Equipment Hirers (India) Pvt. Ltd. Currently a first assistant cameraman for cinematographer Jason West, Dedhia’s jump to camerawork has been an exciting transition and she aspires to become a DOP. And to others keen on manning lights, she says, “Be sure that this is what you really want to do, as it’s not easy”.